Here are some facts about George Stephenson. George Stephenson was an engineer who built the first public railway to use steam trains. He also devised the miner’s safety lamp and built several bridges. 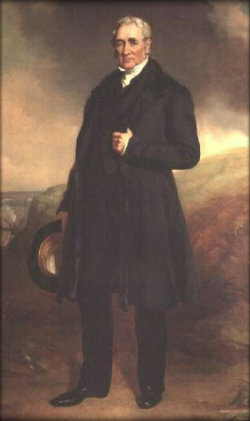 Stephenson was born in 1781 in Northumberland and learned to read and write at night school. He became an expert with steam machinery after fixing the pumping device in a local mine. His first job was keeping a herd of cows out of the way of a horse drawn wagon. He was later hired to build a 13 km mine railway in 1820, the world’s first that was not pulled by animals. George Stephenson also devised a safety lamp for miners that would burn without exploding. An inventor called Davy invented a lamp at the same time, causing arguments between the two men. In 1829, George Stephenson and his son Robert designed their famous steam train, the Rocket. The Rocket was so successful that virtually all other steam trains were modeled after it. The Rocket featured in the opening day celebrations of the Liverpool and Manchester Railway. However, the celebrations were overshadowed by the death of a local MP in the world’s first railway accident. Stephenson is also credited with inventing the standard gauge for rail tracks which is still used all over the world. The Liverpool and Manchester Railway was opened in 1830. It was the first railway in which all the trains operated to a timetable and all passengers bought a ticket. George Stephenson also designed the first bridge to cross a railway line at an angle, for extra strength. The bridge was built in 1830 at Rainhill and is still used today. George Stephenson died on 12th August 1848 in Chesterfield, Derbyshire. He was 67 years old and was suffering with pleurisy, a lung infection. Today, Stephenson’s birthplace is a museum, and there is a statue of him in Chesterfield Station. Several schools are named after him and he appeared on the 5 pound note between 1990 and 2003. What next? Discover some facts about Isambard Kingdom Brunel, another famous engineer, or learn more about the Victorians by visiting our Victorians resources page.